Here’s a good summer job if you don’t mind occasionally wrapping your arms and body around someone hairy, slippery, and naked. 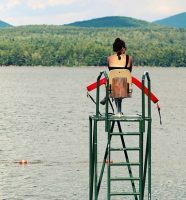 The Dyer Woods Nudist Campgrounds in Foster, Rhode Island just posted a job opening for a lifeguard. You’ll get paid between $12 and $14-an-hour to keep everyone at the resort safe in the water all summer long.